Optimum temperature is always required for the best performance of the engine. Anything overheated reduce the performance of the engine and may damage some parts. The engine is remained cooled with the help of coolant. Coolant keeps the engine temperature low, which helps it to perform well. It is important to keep a check on coolant level regularly. 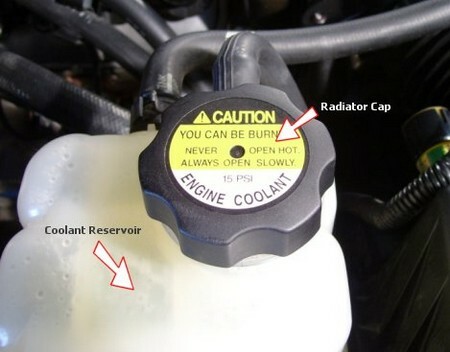 Coolant is also known as antifreeze agent. Coolant not only keeps the engine cool in the hot weather, but also optimizes the engine performance in cold conditions by protecting the engine from blocking. Most of the old models use the radiator system which is cooled with water, but nowadays coolant is used for keeping the temperature under control and avoids blocking of different parts. In many cases coolant is used with clean water. Switch off the engine and park the car on a flat surface. Let the engine cool. Open the hood and look for coolant reservoir near the engine chamber. The reservoir usually has a label showing the “Full” mark. This will give you a clear idea about the level of coolant in the reservoir. Make a mixture of coolant and water according to the given scale, i.e. mostly one part of coolant for every part of water. Carefully make a mixture with right amount of water and coolant. Take funnel and insert it in the reservoir mouth. Refill the reservoir with coolant slowly. Once you reach at the “Full” level mark stop filling. Wait for some time and see if there is any sign of leakage. If you find any leak, first repair it and again refill the reservoir. Recap the reservoir. Close the front hood and start the car until the thermostat turns on. Replacing and checking the coolant level is one of the easiest part of the car maintenance. For those who are new this article can be a great help.